You are currently browsing the tag archive for the ‘wicker park’ tag. I am very happy to confirm that Filter is open for business! Construction at Filter has started! The walls have been framed, rough plumbing and electrical are complete, and major ductwork has been installed. Completion is scheduled for the end of the year. UPDATE (10/02): We have been approved for permit! Construction to start Monday, 10/05! UPDATE (09/22): The plans are out of plan check. We only have a few minor issues to clarify with the Department of Buildings. With any luck the plans will be approved for permit at the end of next week 09/25. Filter has emerged from the Green Review, and will now proceed into the building permit pipeline. We are hopeful to have comments back in a couple of weeks with construction slated to start immediately after. We are on pace for 61 LEED-CI credits which puts us in Gold territory. Stay tuned! The building that will be housing the new Filter hit a bit of a snag in the Department of Zoning, which is why you haven’t heard from us in a while. Rest assured, though, the Zoning Board of Appeals has given the building a green light and we had a successful preliminary intake meeting with the Green Permit Program Wednesday. We are on pace to achieve a Silver rating under the revised LEED v3.0 rating system! Expect another update in a couple of weeks. Filter coffee update: We will be wrapping up construction drawings in the next two weeks, after which we will submit to the Department of Buildings and Health Department for permits. Sandblasting just wrapped up and has taken off about fifty years of grime, check out the photos after the jump. Also, Filter is on pace for LEED-CI, certified level! 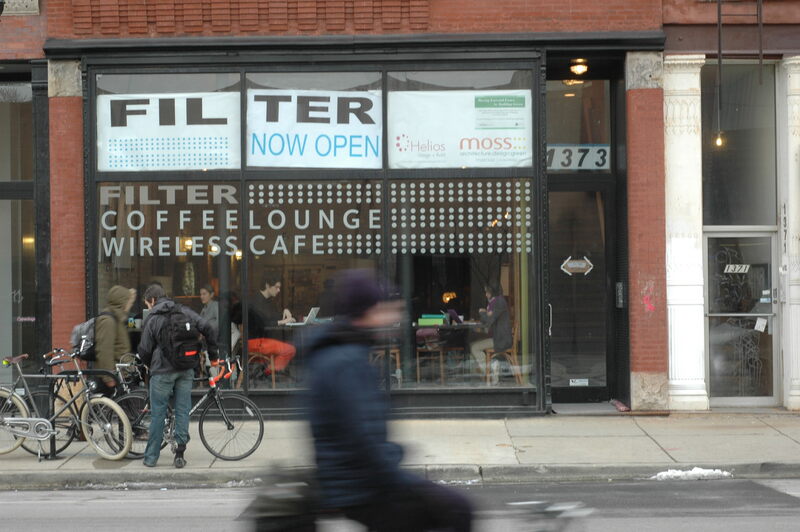 We are currently designing the new space for Filter, the Wicker Park stalwart coffee house that was displaced by BofA from the Flatiron building on the Milwaukee/Damen/North intersection. The project will be aiming for a LEED-CI certification and will be located in the 1300 block of North Milwaukee Avenue. Stay tuned here for updates.